If you click an item and still hold it while alt+tab out, when return back and release anywhere on the screen the item image will stay at that place. It's justa graphical glitch. Hm, could be wrong but think haven't had this one several versions back. Possibly os specific. Does pressing the inventory button sort them again? Will try changing a build setting for fixing this in V25. If that doesn't work (it probably won't) will look at finding a way to capture the ALT-TAB keypress and see if can end the drag event. Not sure if this will work, but there are a couple of options. For sure it got sorted when doing save and reload, that's why called a glitch. So... no. 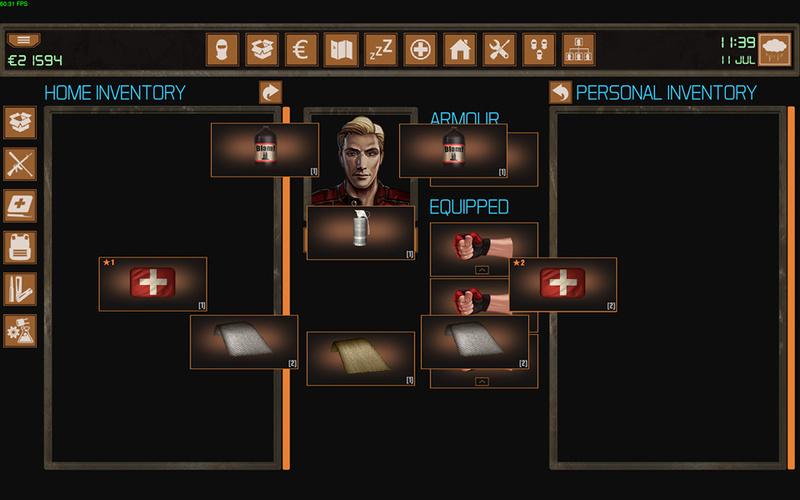 Furthermore, it stays on the same place on screen when you switch between things like inventory, facilities etc. It doesn't prevail on citiscape (which is to be expected as it's separate) but it will be there again when switching from citiscape back. Can't interact with it at all. Windowed won't change anything. Oh, well. Edit 2: Checked some older versions. And it's there. A bad, a bad tester me. Ok it's a bit unfortunate. On the other hand, we can make bulletproof smileys in game, yay! (I swear this sounded less silly in head). Also tested in a battle. And have read "cancel out of a screen when taking something like multiple pieces of ammo" report by Necroscourge on steam. Wonder if related so tried to reproduce that too. In a battle, in addition to alt+tab there are other combinations with 'Esc' or keys for inventory or char. sheet (will specify which when). 1) Alt+tabbing from inventory while holding an item it behaves the same as at home as described above. 2) Escaping to the battlescape (Esc or inv. key) while holding an item and releasing the hold on the battlescape -> then when you come back to inventory the item image might end up released anywhere. Again similar outcome as above. 3) While holding an item pressing any screen changing keys (Esc, char. sheet or inv. keys) and returning back to inventory while still holding (via pressing the inv. key again) and now the hold is released -> Then at first looks it goes to the right place but you may found its image 2x, while it doesn't change the number of items in inventory (though doesn't seem like real item duplication and disappearance). 4) If you were in the process of transferring multiple items and in the moment the "Transfer Items" dialog is on screen and you escape to the battlescape (by Esc or inv. keys) -> then after coming back this dialog is still on screen (and on char. screen too) but its' unusable anymore. The whole inventory (as well as char. sheet) become unresponsive. To be more precise all buttons unresponsive, shortcuts work. Alt+Tabing nor going to char. sheet and back will cause this issue, seems only with escape to the battlescape. However, when you switch to char. sheet the dialog still stays on screen albeit functional. Perhaps always cancel the dialog upon pressing any screen changing key? Once happened seems (1), (2) and (4) will remain for the whole team for the rest of the battle, out of that (4) leads to inventory unusable. The outcome (3) is much less problematic, it corrects itself once you refresh the inventory screen, but guess it's a bug nevertheless. Hey Ushas - working through these now. Have fixed 1+2. Took your suggestion for 4, seemed best way to fix. Moving the character screen also cancels the transfer dialogue. Just fixed 3 now, and there's a cancel button for transferring stacks. Did you encounter the second bug necro scourge mentioned: Haven't seen it happening, but will try to make it happen now. 2. The AK47 has a double tap fire mode, and it selectively works. Twice now I have told the user to fire in this mode and it switched to a different mode! It's bad enough the AP costs to fire it are so high, but the fact the fire mode does not work correctly really hurts. Can try stressing switching modes. It occurs to me, haven't really tested changing it via clicking on the mode name... Though think impression were that it's robust. Dunno. As for changing modes in overall, could be mistaken but haven't it became harder to do in the past few versions? Seems with a key it works but not always with the left-click. On many occasions couldn't change mode via mouse unless was specifically left-clicking on a unit (eg. on target or anyone else). Other times can do it no matter where pointing. But that's probably unrelated. Edit: One more thing - how many APs it subtracted, 5/6 or 8? I've been testing it, but haven't seen it happening. Like you, had the feeling it works as intended. Based on post, it seems to take 8 and fire a single shot. Another possibility is if on an older system, a drop in frame rate might make it harder to see the bullet being fired. Was thinking of possibility that it was burst too. Apart a drop in frame rate can it happen that the game won't play firing a shot? Will describe one suspicious situation happened to me while testing this but haven't recreated since. However, it wasn't many tries, not much free time these days:/ So I urge not to believe me. I don't. There is something strange with adjacent units going on. It may not be the problem here, but let me describe anyway: If you have a gun and there is an adjacent enemy or more it seems the game somehow forces that your unit has to constantly aim at one of those adjacent enemies (esp. if he has a bat? ), no matter at whom else you're pointing the mouse currently. Wondering if this is intended behaviour. What think have seen was that Elena aims all the time at Bianca. And after clicking on Urbana, Elena swiftly turns around, makes a shot and then immediately turns back to aim at Bianca again. Possible I've been clicking around at the time if things can somehow combine. CharMainScript.SetupRangedAttack. Weapon has not jammed. CameraControlScript.CheckIfCameraHasLOSToBothCharacters. Character B has LOS. The log seems to suggest 2 bullets fired, but the second hit a character (which was not the target) and was possibly destroyed. Agree that there's a good chance perception is at play here. Characters will rotate to an enemy that enter adjacent tile. Will look at this when testing - would likely only go after it though if it's causing a bug. Re "Characters will rotate to an enemy that enter adjacent tile": Perhaps just give it a short duration (plus maybe once per turn per unit limit)? Currently it looks behaving like if enter means if adjacent (again just describing impressions). But you'll see for yourself. Not recalling any definite bugs indeed. If you click an item and still hold it while alt+tab out, when return back and release anywhere on the screen the item stays there. Now the difference from before is that the game completely freezes and become unresponsive. If alt+tab afterwards the screen blacks out completely, no HUD, still no response. In either case have to kill the process. Tested at home as well as during a battle. PS: the image sharing site I've been using changed address. Edited the op image, and will repair others when coming across. Please don't hesitate let me know when need any past image or feel free to edit yourself. The edit only requires to change "postimg.org" to "postimg.cc" in the image address. Wondering if the situation might be different on windows. If having time will try check if there are any new linux-specific alt+tab issues to be aware of. 2 & 3) If escape from inv. to battlescape and back, regardless on which screen the holded item released - the item disappears. Don't know if for real, but I don't see it in inventory nor on hands, nor on the floor. The good news is no freeze here! Edit: Seems happens only when the item was initially on ground or on hands. When it was originally in per. inventory it returns there all right. Additionally: when you move countable items from ground to inv. and back through confirming this dialog, it doesn't cost any AP. All except 1 fixed. It's difficult to imagine 1 occuring unless the player is deliberately trying to break game, in which case... tada!